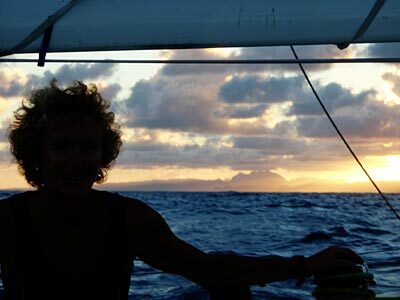 We entered Nisida into the 2008 ARC from Gran Canaria to St Lucia - her second with us and her fourth ever. On board we had a crew of 9 including 5 people who'd never raced on her before. Inevitably this meant we started slowly, but it's a long race, and after a week during which our boat and sail handling skills improved exponentially we found ourselves leading our class. Alas after then the wind died and with it our hopes of still leading by the time we got to St Lucia. The race also took us 3 days longer than last time. But this race is about far more than simply winning, and we were hugely lucky to have a crew that remained unfailingly cheerful and entertaining throughout the 16 days it lasted. Raucous laughter on deck was the norm, while many of the night-time conversations were not fit for repeating in print. Once in St Lucia the very slow nature of the race meant that only a few of us were there for the first few days - giving the parties there an extra feeling of exclusivity. The crew also went sight seeing, sailing and even horse riding with our race opposition, while the after bar closing time parties on board lasted until nearly sun rise. The race left Las Palmas in Gran Canaria on Sunday 23rd November. To give a flavour of how the race unfolded, and the extra dimensions of such a long race, we've repeated below the emails we sent back during the race to our families. We've just crossed the Tropic of Cancer and toasted Neptune with a slug of best Bushmills. Since we wont be getting any of it down our necks for another 2500 miles let's hope he rewards us with good winds to get us there quickly. Just (a relative term in the vast expanse of ocean) off our starboard quarter at present is Disco Inferno - a Bordeaux 60. The opposition from our class are all further east (or were at yesterday's report time). We'll find out this afternoon whether they were all luckier in finding this lovely wind earlier than us last night. The big decision now is when to head west. This looks like being much later than two years ago, or indeed usually, as there is a large low pressure in our path in mid Atlantic. Some of the bigger cruising boats, who can motor, have gone straight for it - presumably reckoning they have enough fuel to get through the large calm patch it if it hasn't moved. Last night we were accompanied by lots of dolphins and a submarine. A yellow flashing light isn't something we are that used (and hovercrafts are distinctively noisy) so we turned on the radar to check it really was just a submarine periscope. For the first time since we left Gran Canaria four days ago we are finally eading somewhere in the direction of St Lucia, having just gybed onto a course of 250 degrees. Alas this may not last - we're simply getting round the Cape Verde islands before gybing back south again to keep down in what trade winds there are. This was only our second spinnaker gybe of the trip - the first took us two attempts. Luckily our fast improving deck work meant this one went smoothly as the seas are now huge and the wind up at 20 knots. The gybe will have slightly spoiled our 24 hour run (which is point to point) but it should still be comfortably our best to date - we've been spinnakering non- stop since yesterday morning and enjoying some fabulous downwind sailing at speeds up to 14 knots. Yesterday we also passed another yacht - P42 with former LCSC member Paul Berry on board. Paul radioed us before we disappeared over the horizon to ask why we'd taken so long to cach them up. Fair point but while they were practicing hard every day back in Las Palmas, we reckoned that 2800 miles of race was plenty of time to perfect our sailing skills and used our time on shore to much better effect. Paul asked us to have a rum punch waiting for him in St Lucia so let's hope we can stay ahead of them. Food has been much less in focus on this trip than on the delivery from Malta - firstly we're racing and secondly it's bikini weather and not nearly snowing. But the downwind sailing and consequent upright state of the boat mean that cooking and eating still take on more importance than on a short slog to windward with a pub at the end. The highlight so far has been Barry's Burger Bar which opened for lunch yesterday. We haven't had to eat any flying fish for breakfast yet but we did have our first one on board last night. Luckily for the fish-phobic helmsman whose ankles it was flapping round the Irish game-keeping (poaching?) skills came to the rescue and the fish was smartly despatched back over the side. We've just gybed (we're getting good at this now) back onto a more westerly course - but we still have more southerly to make. For those of you confused as to why we've gone quite so far south, the reason is that our weather forecasts show that a large low in the middle of the Atlantic has spread a long way south with large expanses of no wind. Our latitude now is 16 degrees 08N, and we reckon we'll need to go down to 14 degrees (the same latitude as St Lucia) to get round the bottom of it. Once we're past it we should (fingers crossed) get good winds across towards St Lucia. This very unusual weather system has split the fleet. The cruising division are allowed to motor and so some have them have braved going through the low. Two smaller racing boats have also risked going due west. We are now glued every day to position updates which come through about 7pm your time. 3 big (80 ft) boats are well ahead and then there are 6 of us racing fairly together. Three - Fair Do's, P42 and Desna, all in our class - were further north and a bit further west than us yesterday. We hope they have to make a hike south in the next day or so. South of us were two boats from the big racing class - Stormvogel and Nova 1 (the former Venom - a Volvo 60). We've had some varied wind over the past two days. After our 230 mile day (where we were romping along under our small spinnaker) we then had a few hours of fun goose-winged where did 120 miles in 12 hours - with some fabulous hurtling down waves in pitch dark (we've had no moon at all so far) before we then ran into very little wind and the remains of a nasty sea and blobbed for the second half of that 24 hour run. The last 24 hours have all been under spinnaker - trying to make optimal speed downwind and gybing fairly frequently (so it wont be a great 24 hour point to point run). We'll gybe again to head more south when the wind swings back to the east from north east. The sailing remains fabulous and it's very hard to believe it's late November. Suntans are improving fast and now we're better used to sleeping off watch at night we're all much more sociable off watch during the day. Tonight marks the last of our fresh meat and from hereon we'll be cooking using at least one of corned beef, freeze dried chicken, tuna and chorizo. Recipes available on request. We finally reached the halfway mark this morning - 1445 miles gone and 1445 to go. Since the straight line distance is only 2600 miles you can see how much further we have already had to travel, and alas this will remain the case. We are currently heading south of west still trying to keep out of the worst of the light winds between us and our first rum punch. They cant be avoided completely and we fear a a day or two of winds under 10 knots which may make our daily runs very small indeed and may also allow the boats behind to catch up. It's all much more stressful now that we seem to be leading our class. Last night we spent sailing along on port tack with the big spinnaker up (very nervously, it's our most used sail and we ripped it and only just got it down in time the other day) when a light appeared on the horizon. This stayed on our bows and turned into a ship with a selection of lights which required the skipper to be aroused to confirm that it was an LPG carrier (hence the extra red lights). It passed down our port side - looking like it might have altered course to do so - quite a coincidence in all these thousands of miles of bare ocean. We also saw two other yachts during the day yesterday but who were not in our race. Today it is Eric's birthday. Tonight we have a cake and candles for him but any further celebrations (and an uninterrupted night's sleep) will be postponed for a while yet. We've had some great days of trade wind sailing; blue skies, 20 knots of wind, surfing the waves in bikinis. But that all now seems a long time ago as we currently have weather which us Brits and Irish find all too familiar - grey skies and occasional downpours. And very little wind - the south westerlies of the low pressure to the north of us are cancelling out the easterly trades. At least it's not cold and swim suits are still the norm. But prospects of reaching St Lucia anytime in the next week are fast receding; we've got 300 miles to go now before we get to what we now view as the mythical trade winds - and we're currently doing 5 knots�. And at least we are still in company, with the race between the 5 of us still very much on. Not surprisingly in these light winds Fair Do's has slipped through, but we have to date kept off the other lightweight oppo - P42 and Desna. Paul Berry from P42 has just radioed us to say they can see us ahead- we saw them ahead of us yesterday but we got back though them last night. Paul said he was on sail mending duty (there were one or two mini squalls last night) - our skipper meanwhile was (successfully) mending the fridge. Not that we've got that much food left which needs a fridge - we're onto canned, dried or long life rations these days. Tonight the fare being prepared is chorizo risotto Irish style. But at least we do have lots of food so rationing is not an issue. And if we were worried about water (we're not yet) we could collect some of the rain which I can hear lashing down on the deck. We've moved from being glued to position updates to glued to weather forecasts. These didn't make nice reading this morning. But we have had some decent wind to sail with today - at times anyway- so fingers crossed they will continue to be wrong. Today's is Barry's 40th birthday, and we managed to give him the best possible present of 15 knots of boat speed on his 5am to 8am watch. And the sun even came out and we managed some fabulous video clips of us surfing along under spinnaker. The wind was driven by a black cloud we'd sailed under - and didn't stay that strong for long, but we still managed a good hour of fun, boosting our daily run to 180 miles. We hope this has got us away from the 'chugging' class which had caught us up as we sat becalmed, and were then motoring past us...Never mind the three Challenger yachts - built to race round the world - who have retired from the racing division and are also simply motoring to St Lucia. It's now down to under 900 miles to go which seems like the home straight. But the wind is still fickle and will remain so until we get through the trailing edge of a frontal system - another 200 miles to go until we do. Our speed is currently 7 knots so that could take a while. Once we do get though it we hope for proper north easterly trades to whoosh us to St Lucia. The sun has been out all day - a far change from yesterday's downpours. The now daily job of mending our big white spinnaker with sticky back tape became impossible - it was too wet for tape to stick. Instead we've been sewing it and are praying it will last until St Lucia and a proper repair. This time two years ago we were recovering from our first night ashore after a crossing that took 13.5 days. This year, over 14 days since we set sail, we've still got over 500 miles to go. But finally we have what seems like consistent wind! For the first time in a week, yesterday evening we came back up on watch to the same wind as we had left (and not a flat calm). But that was after a day when we'd spent 6 hours drifting in a torrential downpour. That we still managed a 180 mile run shows how fast the sailing has been since. We're now romping along at 10 knots plus and hope the clouds with their squalls and (more frequently) calms are behind us. But still absent are the wonderful rolling waves which only three of us on the crew (Eric was on a rival boat) remember from two years ago. Sailing down them is like hurtling down a moving escalator. With all the trade wind disruption this year there's no chance of them, and we have to remember the more token efforts of over a week ago as all we are likely to get. Amongst the multiplicity of conversations on deck (and nothing like lots of new faces and multiple nationalities, never mind Irish blarney, to add whole new dimensions to the long nights of banter) we've discussed whether we'd each do this race again. Surfing down the Atlantic rollers is a must do - but we're speculating about of doing so via the Cape Town to Rio de Janiero race in 2 years time. 3,500 miles of 'guaranteed' trade winds and rollers. And so much more cred back in the club bar at home. But for now there is this race to be finished. Alas our chance of a class win disappeared in the 'doldrums', and one of the lightweight carbon machines looks certain to take that glory, but we're still hoping to overtake back some of the motoring class who sneaked by us in the rain. This hasn't been a race where many records have been broken (except perhaps for the longest distance whereby to cross an ocean) but our 24 hour run to 9am today (noon to noon for most of you guys) of 242 miles was a record for the boat, breaking the one of 230 we set what feels like an eternity ago of earlier this race. So for now there are some good trade winds, but we gather that behind us some of the slower boats may get held up yet again. We've had an email from one of them asking us please not to drink the bar dry before they get there. I'm sure we'll give it our best shot, but I also suspect that after 17 days of abstinence we may fall over first. We've now (at 920 am boat time, 820 St Lucia time) got 105 miles to go to the northern tip of St Lucia (from where it's c 2 miles to the finish) and we're doing 9.5 knots. Mathematical calculations have been frenetic over the past 36 hours, working out whether we would make closing time tonight. Our record run has pretty much assured that we will, especially as the wind is forecast to pick up a bit today. Less certain is whether the marina's showers will be by passed en route to the bar. We've been having salt water showers en route but even to our de-sensitised noses the boat (and therefore us) doesn't small very fragrant.....let's hope the others in the bar (and we expect to meet and swap stories with the crews of Desna, Nova 1, Stormvogel and Fair Dos') have been similarly tempted by the lure of fresh food and cold beer. We havent got today's positions yet but we think we should be the 11th boat to finish. That's two better than two years ago, and given the massive advantage in motoring this year this is a much better result. It also looks like we'll finish third in our class to finish and 5th racing boat overall - both also better than last time. Clearly we are very disappointed not to have held onto our class leading position, but the way Desna and Fair Do's have held ahead of us over the past day or so of stronger winds shows how well we'd done to get ahead of them in the first place. 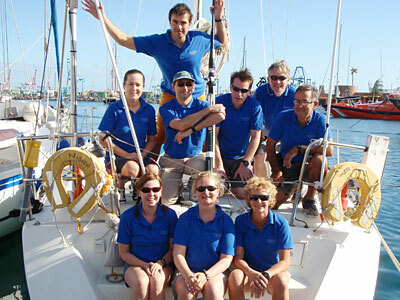 Crew: Peter Hopps (skipper), Hilary Cook, Val Nedyalkov, Jenny Scott, Pamela Cranston, Gabriella Kaes, Eric Jacquier, Phelim O'Connell, Barry O'Sullivan.